Located in the heart of Minneapolis, Augsburg College has a strong history of collaboration and partnership with its community. And now, as Augsburg has worked to recruit students for the 2013-14 academic year, it has another offering to draw the best talent — in the classroom and on the field. Prospective female students with a passion and talent for the increasingly popular sport of lacrosse are now being recruited and placed to play the sport at the collegiate level. The Augsburg varsity lacrosse team is the first at any college or university in Minnesota. Lacrosse is a constant motion, full contact team sport with the objective of throwing a ball into a goal, much like in hockey, only using a meshed stick to carry and toss the ball. Ten players on each squad play on a 100-meter field. Each goal is 5.5 meters wide and is guarded by a goalkeeper. Since lacrosse is one of the fastest growing sports and draws many female athletes, Ross sees great opportunity for it as a recruitment tool. The addition of lacrosse builds on Augsburg’s commitment for creating opportunities for women to participate in collegiate, varsity-level sports. It is the second time this ELCA college has been the first to bring a varsity women’s sport to the state. In 1995, Augsburg was the first to add a varsity women’s ice hockey team. 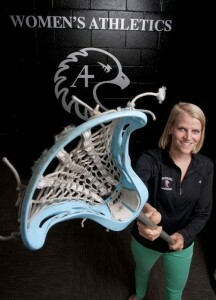 With the addition of the lacrosse team, there are now 11 women’s sports at Augsburg among the 21 varsity-level sports. “The team demonstrates our firm commitment to upholding Title IX and means we are able to provide greater access for women to athletics,” wrote Devon Ross, a member of Augsburg’s admission staff who works with recruiting student athletes. On track with the program’s recruiting goal, Augsburg expects to have 20 to 25 women ready to play collegiate lacrosse for its inaugural season. Led by Head Coach Kathryn Knippenberg, the team began practice in June and will begin their inaugural season by hosting a tournament with three other Division III schools February 22-23, 2014. Knippenberg was named the women’s lacrosse coach in September 2012. She comes to the position with experience as the girls’ lacrosse head coach at the Academy of Holy Angels and as the president and team captain of the University of Minnesota women’s lacrosse club team. A 2008 graduate of the University of Minnesota, she is also the co-founder and president of the North Central Women’s Lacrosse League, which manages 22 college club teams in Minnesota, Wisconsin, North Dakota, and Iowa. As Augsburg’s head coach, she is focused on building a team. “This year I can recruit athletes who may not have [otherwise] considered Augsburg,” Knippenberg said. While no other teams in Minnesota have passed approval for the 2014-15 academic year, Knippenberg is optimistic that within the next five to ten years a conference will form. For the 2013-14 academic year, Knippenberg is simply focused on getting the team established. “Our hope is for the team to start off strong, if not the first year, then the second year,” she said, noting that the team will compete with other teams that are also in the development process. As the first varsity-level team in the state, Augsburg does not belong to a division, but will play as an independent team. The women will travel to three Midwestern states, along with Texas, for their games. This new addition has not joined Augsburg quietly. “There’s a lot of buzz in the community about the new program,” Knippenberg said.